A recent study has found that the fall of an item’s popularity mirrors its rise to popularity, so that items that become popular faster also die out faster, which is demonstrated by name trends. Image caption: Berger and Le Mens. ©2009 PNAS. (PhysOrg.com) -- "Why is everybody suddenly wearing those new sandals and listening to that new band? It's so trendy!" A recent study has investigated this sentiment in order to understand why some cultural products and styles die out faster than others. According to the results, the quicker a cultural item rockets to popularity, the quicker it dies. This pattern occurs because people believe that items that are adopted quickly will become fads, leading them to avoid these items, thus causing these items to die out. In their study, Jonah Berger from the University of Pennsylvania and Gaël Le Mens from Stanford University and Pompeu Fabra University in Barcelona have investigated why things become unpopular, and have found some surprisingly counterintuitive results. Their study is published in a recent issue of Proceedings of the National Academy of Sciences. To investigate how cultural tastes change over time, Berger and Le Mens analyzed thousands of baby names from the past 100 years in France and the US. 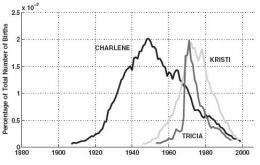 (Because there is less of an influence of technology or advertising on name choice, baby names provide a way to study how adoption depends on primarily internal factors.) The researchers found a consistent symmetry in the rise and fall of individual names; in other words, the longer it took for a name to become popular, the longer it took for the name to fade out of popularity, and thus the more staying power it had compared to names that quickly rose and fell. The effect was robust, occurring in both countries and across various time windows. To find additional support for this relationship, the researchers also interviewed expecting parents on how likely they would be to give their children certain names. Afterwards, participants rated their perception of how trendy each name was. The results showed that parents viewed names that had experienced sharper recent increases in usage as fads, and avoided these names in accordance with this concern. As the scientists explain, these findings suggest that beliefs about the evolution of popularity may be self-fulfilling. There is no mathematical necessity that forces cultural items (such as names) that sharply increase in popularity to die out faster, but people’s beliefs have the ability to create this reality, since people don’t want to be seen as following the herd. This effect is an example of how psychological processes shape culture, in addition to the more widely known reciprocal dynamic, that culture can shape thought processes. Besides baby names, the symmetry between popularity rise and fall can carry over to other cultural items. For example, the scientists noted that similar outcomes have been observed in the music industry, where new artists who shoot to the top of the charts right away also fall quickly, and so have lower overall sales than those who rise more slowly. While this finding seems counterintuitive, since a quick rise in popularity would seem like a good thing, it shows that a backlash to perceived fads should be taken into account. As the researchers explain, people who want to ensure the persistence and success of particular items should seek to popularize the items at a slow but steady pace. More information: Jonah Berger and Gaël Le Mens. “How adoption speed affects the abandonment of cultural tastes.” PNAS, 8146-8150, May 19, 2009, vol. 106, no. 20. Well, looking at the Wikipedia articles on rock bands -- which for some reason marketing departments seem to think need dozens of citations for statistics that are so boring that I don't even read them when they pertain to my favorite groups -- The fast rise to the top of the charts for already popular acts is *anything* but mirrored in how quickly they become unpopular. I.e., one basic statistical premise of this article is flawed. Let alone the conclusions. No doubt Apple are regretting their faddish iPhone took off so quickly. It will probably disappear by next week. Interesting how little this has to do with SUBSTANCE... It matter little what the idea IS, but how it is preceived by the "herd". Barack can say the same things as W (e.g. leave Iraq as soon as they can protect themselves, but not NOW; close Guantanomo "as soon as we figure out where to put the prisoners"; in Palestine, "we back a two state solution" as soon as the Arabs agree; BAILOUT! ...whatever the cost! ; etc. etc.) but he gets heaped with praise because he uses formal English instead of "Texan". One thing the Left and Right agree on: they are frustrated that politicians seem to always claim one thing but do another! I'm not sure we should all be so quick to generalize some data on baby names into a theory of "why things become unpopular". There are certainly many examples of things, such as Hotmail, that were quick to gain in adoption, and slow to lose it. A minor criticism of the study: the authors seem to underestimate the role content (and, in part, quality) may have in both the quick rise and the quick fall. Parents aren't so much following and avoiding fads intentionally as trying to pick good names that express that their child is special. Some names do that by sounding solid and borrowing from tradition (religious, family, national, etc.). So William and Emily are here to stay, and parents who pick these names won't worry much about whether other people are picking it, too. Other names say a child is special by sounding exotic and/or expressing a cute concept or tone. So Navaeh went from nonexistent in 2000 to the top 40 names last year (probably the quickest rise ever). But the same odd sound that made it sound exotic will make it sound common soon. And people will also realize that "heaven spelled backwards" is not the most profound statement to make about their child (William's "resolute protection" is much more contemplative, for example). The article (or study authors, I can't tell which) seems to imply that marketers might want to intentionally slow the adoption of a product to increase longevity. But if your product is gaining popularity because it performs a function better than previous products, a quick rise in adoption will not prevent long-standing dominance. The makers of the Ford Model T, the microwave, and the ipod, to take a few examples, did not lament the fast launches of their products. Conversely, if your product is gaining popularity mostly because it seems unique and new, there's no way to prevent its decline, all you can do is lower the peak. Naveah is a fad because by its character it was destined to be a fad, the only question is whether it was going to be a big fad or a small one (actually, the decline hasn't started yet, I'm just predicting/hoping). How can anyone forget one of the biggest examples of "easy come easy go" of 2008: Sarah Palin. The first week or two she was going to do everything but take away the sins of the world, but shortly afterward her addition to the Republican ticket was quickly revealed as an idiotic move and probably did more than any one thing to make the wheels come off the McCain campaign.